Can You Really Tone Your Body With Exercise? Most people think that toning your body means getting more definition and firmer muscles by doing more reps with lighter weight. What you may not know is that this idea of toning the muscles is a myth. The word tone simply describes the state of your muscles. When at rest, your muscles are in a constant state of partial contraction in order to be ready for action. The tone of your muscles is involuntary, so you can't change it by lifting weights a certain way. Over the years, people have taken the word tone and redefined it to mean how lean we are and how defined our muscles appear. It's even a gender-specific word. Women go to the gym to tone up while men go to the gym to lift weights and build muscle. The truth is, they're the exact same thing. Becoming lean and building muscle requires lifting weights. The difference is in how much you lift. You can't make a muscle longer without surgery and you can't etch it into a certain shape or look. If your goal is to see your muscles, your goal isn't toning, it's actually losing body fat. And, whether you're a man or woman, wanting to bulk up or slim down, you'll do the same kinds of exercises and training methods. The difference lies in the weights, reps, and sets you'll do, as well as how many calories you take in (more if you're building muscle, less if you're trying to lose fat). You may be wondering why it matters if you believe in toning or not. The problem with the idea of toning is that it leads to another stubborn myth called spot training. The myth of toning is often tangled up in the myth of spot training. Someone might say, "I want to tone the backs of my arms, so I'm going to do triceps exercises." You can, and should, work your triceps muscles, but that isn't going to get rid of the fat around your triceps, which is what keeps you from seeing that muscle. If you reduce your calories, lift weights, and do some cardio, you can lose body fat. Can you lose it over your triceps? Sure you can, but only your body will decide when, or if, the fat over that particular area will go. If you're convinced that toning doesn't exist and that you can't spot train, you might be wondering why you should even bother lifting weights. If a bicep curl isn't going to make your biceps more visible, why do it? This is where a shift in perspective needs to happen. Instead of focusing on individual body parts, such as more defined shoulders, you need to focus on your whole body, working it out with cardio and weights. Muscle building, which burns fat. You'll build muscle, which helps with fat loss in the long-term. A pound of muscle can burn about 20-30 calories a day. A pound of fat burns about 5 calories a day. The more muscle you have, the more calories you burn all day. Stronger muscles. You'll strengthen muscles and connective tissues which helps you perform better, whether in daily activities or physical activities and reduces your risk of injury. Keep muscle mass. 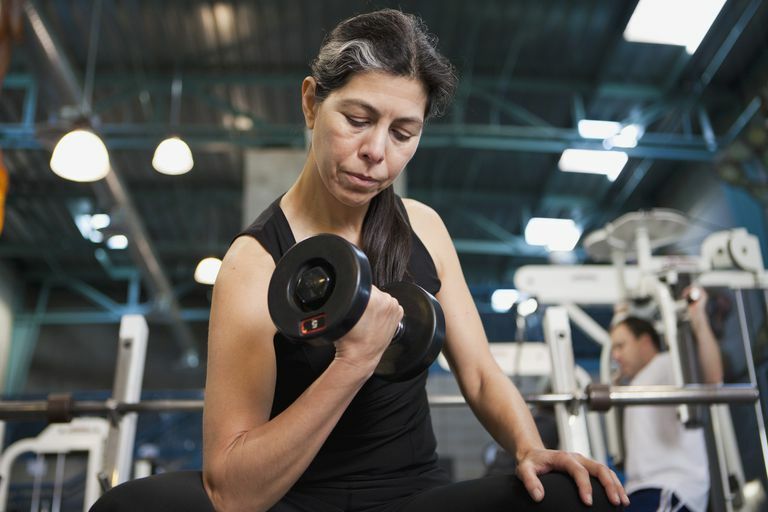 You'll preserve muscle mass as you age. We naturally lose muscle over time, unless we lift weights. Stronger bones. As you age, this is especially important as bones get weaker and more fragile. Overall benefits. You'll improve your flexibility, stability, and balance. Increase self-esteem. You'll feel better about yourself. Whatever your goal or gender, don't be afraid of heavy weights. It takes a lot of hard work to bulk up—both men and women can find it difficult, though women don't have enough testosterone to get huge muscles.